Taxi Dispatch Software is transforming the entire taxi service from the traditional way to contemporary. There are lots of taxi service providers companies who have revolutionized their manual taxi booking service by adopting mobile applications to manage their booking and dispatch operations. This revolution has made the entire taxi booking procedure easy and fast right from the booking to online payment. 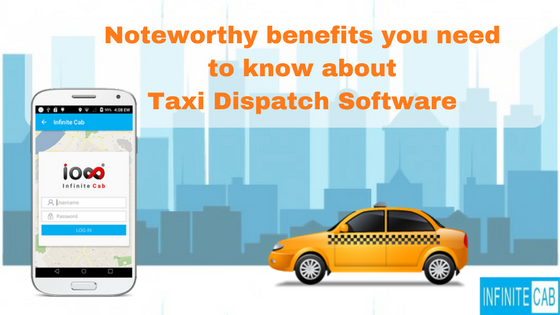 A Taxi Dispatch Software helps a cab business owners in booking, managing, and dispatching all bookings and taxis. People are preferring now booking flexibilities. Taxi Dispatch Software or Taxi Booking App helps commuters to book a taxi without wasting their precious time. It has introduced some notable features such as GPS integration, using that facility, driver and passenger can track each other’s current location and passenger can see the estimated arrival time of the driver. Taxi Booking Application through mobile facilitates future booking and also it allows canceling the trip. Now, waiting for the taxi and bargaining for the proper rate is transformed into the quick and comfortable ride with the right and pre-fixed fare. Taxi Dispatch Software has reduced passengers’ all these manual steps and troubles towards for getting a ride by integrating phenomenal features and real-time feedback. A taxi dispatch system is relied on by all taxi owners for its cost-effectiveness, fully automated operations, enhanced productivity, brand awareness and customer satisfaction. An excellent and robust Cab Management System enables to increase the number of bookings. The location-based GPS mapping supports real-time location of the available taxi to get more people to book a taxi online inspires the customer occupancy rates to a higher extent. Increase the total volume of taxi rides with the appearance of mobile apps or taxi dispatch software with the superior quality and reliability. Commuters prefer qualities and comforts that result in more passengers on board and thus, taxi owners get a higher revenue and prestige too. Online ride reservation allows a passenger to track a vehicle and driver details that decrease the safety anxieties. Taxi Companies who provide online booking through taxi booking app ensures the passengers’ safety. The high-quality service and comforts increase your number of passengers and increased passengers will help you to build brand recognition. Serve your customers a quick and superior ride and therefore you will be able to build the trust and loyalty of your brand. A fully featured e-hailing app facilitates with real-time updates, reports can improve the capabilities of the dispatch process. Additionally, GPS has made extremely easier to ensure the safety of the vehicles and a substantial reduction in the accidents. With the Taxi Dispatch Software, you can improve the quality of service that you can offer to your drivers and passengers. Your passengers will save their precious time by booking online and also they can pay online through e-wallet. Taxi Booking App has reduced the efforts and eliminated the long wait of getting a ride. While online booking, passengers can track a nearby taxis and gets a ride within a second. If passengers are getting immediate rides, better quality of service without any hassle then without any doubt passengers will definitely get satisfied with easy and quick taxi booking. A Cab Management System helps to grow your business. It enables auto function such as taxi booking for future, current location tracking, auto fare calculation, cashless payments and rating & reviews on completion of a trip. These all features save time and efforts and enhances the standard level and quality of services that help to boost taxi business. Above mentioned benefits of Cab Management Software, ensure to grow the Taxi Business with branding. Go with Taxi Dispatch Software and give your passengers an automation and choice to book a taxi.